Holiday Message from the Chief Simplifier & Elf! Happy Holidays! The Chief Simplifier [a.k.a. C.B. Whittemore] has become the Chief Elf with intense yet simple words of wisdom that she intends to apply to herself this Holiday Season! Focus on what's essential this Holiday Season. Focus on the positive sources of energy around you. If you can't come up with constructive solutions to the negative, then take a break from it. Once recharged, I bet constructive solutions will appear immediately! What's essential to your customers, your business, you? What are your positive sources of energy? When you look back over the year, what worked? What offered you valuable insights and generated those Aha! moments that led to successes? Can you recreate more of those moments? That said, how do you plan on making the most of the Holidays so 2010 becomes not just filled with possibilities, but also marvelous realities? How will you Simplify, Recharge and Refocus! Happy, happy Holidays and all the best for 2010! 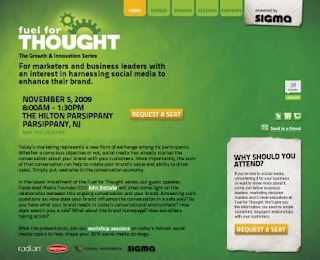 One last post to share with you from Sigma's Fuel For Thought, the Growth & Innovation Series. This one about Visual Goodness. Visual Goodness is an 8 year old digital production shop in New York City with expertise in animation and development, 3D/motion, video production... They also struck me as creative to the hilt - in a practical way! Chuck Acker, chief of new business at Visual Goodness, introduced Mark Rosal, creative manager. "No matter what the product, service or industry, the most important goals in building your brand online are starting a relationship with your customers and maximizing user interaction time with your brand. In this workshop we’ll explore case studies where brands are going above and beyond to engage users right where they live by maintaining deep customer interaction while building mindshare and influence." + As individuals, we are connected and overloaded with information. + But, as Clay Shirky has observed, the problem isn't information overload, but rather "filter failure." + The same is true for customers who are developing better filters. In our current age of immediacy, people have multiple means to get to goals and they bypass the user experience we create to get to what they want faster. And, they want what's valuable to them [i.e., relevance]. + Be a unique story teller. As example, HBO Imagine.com, which redefines story telling. This post, HBO Imagine: Clues, Cubes and Mimes offers an overview. At all points, viewers [participants?] can share via Twitter and Facebook. Have you participated? What's your reaction? This example intrigued me. Visual Goodness created an experiment Mark referred to as "The Twitter of OZ." It answers the question "What if the main characters in the Wizard of Oz were on Twitter?" Here, Dorothy, Scarecrow (coming online soon), Tin Man, Cowardly Lion, the Wicked Witch, the Wizard and Glinda the Good Witch tweet their experiences in real time, 140 characters at a time? Using Hootsuite to manage the multiple characters and story lines, Mark put together a script for the story with the goal of observing what would happen. He quickly got rid of the script when a new unexpected character showed up and he had to engage and react in real time. This was a public experiment; for authenticity, he decided not to use a hashtag symbol [also left more space for content]. This approach requires understanding where users are and engaging with them - talking to them - at the right moment. In this example, imagine having passersby text a message that is immediately projected onto a building in a busy urban environment. This was the "Who you for" text message campaign that spoke to people at the right moment and created word of mouth in a new medium. + Flickr has active forums such as the Canon DSCR group. 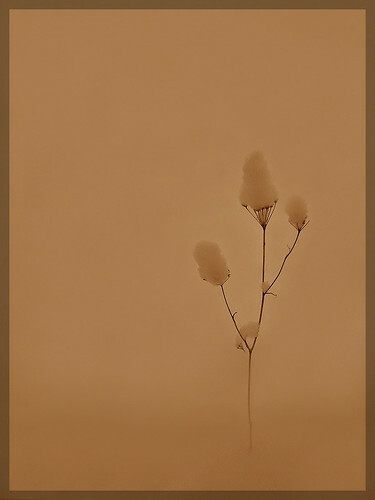 This is a self moderated group with distinct rules and guidelines on how to tag photos, etc. Note that it includes over 54k members! + From Visual Goodness, ESPN Monday Night Football Paper Football & Music Maestro. As you think about maximizing the user experience for your customers, what do you find most effective? How do you highlight value that is relevant to them? How do you align what you offer with the filters customers have created? Subscribe to Simple Marketing Blog's feed. Simple News & Insights: Available Now! Can you believe? I almost forgot to share the news... 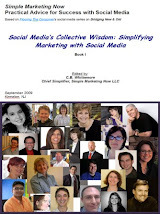 The latest issue of Simple News & Insights, the eNewsletter from Simple Marketing Now, is available as of 12/02/2009. You can access the December 2009 issue by clicking on this link to the 12/02/2009 archived issue of Simple News & Insights. I've tweaked the format a bit [and even remembered to include the 'forward to a friend' link!]. I welcome your feedback. 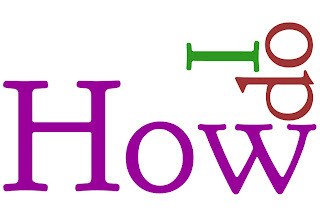 This week I issued the first Simple Marketing Now Flooring eNewsletter. You can check it out on Flooring The Consumer. 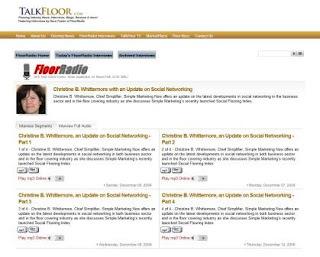 Here's the post to look for: Flooring eNewsletter #1 From Simple Marketing Now. As the name suggests, it is flooring-focused. Any suggestions on how to improve either eNewsletter? I consider listening hugely under appreciated, particularly in traditional marketing. We might listen at arm's length via a focus group, but not up-close-and-socially. Start with the most basic and flexible tool available: Google alerts - which, surprisingly, many traditional marketers don't know about. Set up alerts for your name, your company, your brand names, your competitor names, subjects and topics that interest you... It costs nothing. Definitely explore terms and subjects of interest at a search window first so you can validate that you are getting the kinds of results that interest you. And, then, refine. I like to start with Google Search; then I create my alerts, monitor my results over a few days, and refine them. Interestingly, Google has just added real-time search integrated into search results pages. It's particularly relevant [and noticeable] for very hot trending topics like Tiger Woods in December 2009... What that means is that you'll see relevant Twitter results appear in your search results. One-stop listening. Finally, Twitter. You don't have to have a Twitter account to search Twitter. But, if you do have an account, you may find this post on Listening To Customers With Twitter helpful. In addition to always having a search window available, I keep a permanent browser tab open for Twitter Search. Simple Marketing Starts With Listening. It leads to insights. You want to tread carefully, though, as you enter into the world of those you want to listen to. Social media interaction is often described as the equivalent of entering into a living room or a kitchen where conversations are in progress. You can't just barge in and take over. Definitely read through these 16 Social Media Tips Relating To Listening. "... Listen/read first. Don't try to join in on a social media conversation until you've spent some time learning how others are using that conversation (learn the "slang") otherwise you could jeopardize your future standing with the community that you are trying to reach." That means that you should definitely listen with social media. But, do so respectfully, intensely, authentically, open-mindedly, creatively and simply. Beware of too much baggage [e.g., you might find this post about Listening To Women Customers helpful]; it might prevent you from hearing the obvious. Are you ready to listen with social media? What do you find works best for you? And what insights have you uncovered? In my last post about Sigma's Fuel For Thought, the Growth & Innovation Series, John Battelle discussed the Conversation Economy and how marketing is everyone's job. In a breakout session, Pete Spande - also from Federated Media, continued the discussion and shared examples. In his presentation, Pete Spande reminded us that we're in a period of evolution rather than revolution. Conversation has always driven consideration, but we've simply forgotten this for a while. Furthermore, we don't have a neat funnel. Rather, we have complexity at the center of the funnel. No one size fits all; it varies per customer. However, social/conversation media combined with a vendor message influences buying decisions. For an advertiser, though, the conversation needs to be at scale. Conversation at scale means harnessing social media to create conversations with your customers - offering value that dovetails with the social media publisher you advertise with. As Federated Media describes it, it's built on Conversational Media: "we believe that the best conversations are those where all parties are engaged, informed, and valued. Working with our marketing and publishing partners, Federated Media is helping to define this innovative form of online marketing: a three-way dialog among creators, audiences, and marketers." According to the Forrester who developed the Social Technographics Ladder, Social technology growth marches on in 2009, led by social network sites. More specifically "in 2009, more than four out of five online Americans are active in either creating, participating in, or reading some form of social content at least once a month." As the chart below illustrates, the level of conversation is increasing consistently. The question becomes, particularly for brands: how to be part of the conversation economy? These are all major media properties that built their audiences organically, have successfully engaged via the social web customers [e.g., via comments, time invested on site, voting, sharing, etc. ], thereby amplifying messages through sharing and building significant equity. In short, it's content that creates conversation [remember, this is the conversation economy!]. For example, Mashable.com published a post about 4 Ways News Organizations Are Using Twitter Lists. 3 hours after it went live, it had generated 20 comments. As of 12/8/09, it has been ReTweeted 1268 times, and strong search equity for "news organization use Twitter" [i.e, page 1 on Google in position #1 or 2]. Take a search for chocolate milk recipe. Pioneer Woman's post about Decadent Chocolate Milk appears on page one. It has also generated as of 12/8/09, 1467 comments. Wow! 5 case studies : How to use conversation as a marketer? American Express Open Forum where content is used in an ad unit. Note the bottom of the page and the wealth of options relevant to small and medium businesses. The results: 5-15% interaction rate and a click through ~3x average ad unit performance. FM details on Open Forum. Unfortunately, I couldn't find a link to show this to you. However, FM created resource centers for Samsung with curated content combined with Conversationalist ad units that included CNET pricing information. To accommodate this unusual approach, the landing page was rethought to help with the purchase decision. By the way, a benefit of the conversationalist ad unit is that content remains fresh. The dooce community recently [i.e., early November 2009] launched with 5000 signing up on the first day. Not bad! Federated Media created the site with Suave as sponsor. You'll notice a range of interactive branding elements, from ad units that invite you to learn more, to statements about Suave that are ready for ReTweeting. Asus entered the US PC market 2 years ago. As a result, it had no baggage yet ample opportunity! The WePC site allows visitors to dream about their ideal PC and submit ideas. Asus took some of those ideas and integrated them into their next generation product. The company learned that it had to lean into other communities to get submissions. For example, it sponsored an art context with the Facebook Graffitti application to envision what future technology would look like; it received approx. 5000 submissions. Explore the WePC site. You'll notice video clips and opportunities to vote or discuss ideas and concepts. What a way to engage PC users. ExecTweets captures the best executive Tweets. It's designed for selfishness, allowing followers to consume the information as preferred. With over 1 million followers, it captures relevance. The ExecTweets website page also includes sponsored sidebars. It also adds value to existing conversations, embraces what customers using, provided options to give customers control of the experience [note that you can select industries], and it builds and supports assets to build longterm value. I found Pete Spande's presentation fascinating. For the most part, I find digital ads clunky and irrelevant. These examples made more sense to me given their relevance and level of engagement. I'm not surprised that they deliver results. What are your reactions? What kind of digital ad units do you click on? What success have you seen with your digital ad efforts? I love attending the Columbia Business School BRITE events because - inevitably - they recharge, refocus and re-inspire me. BRITE '09 took place March 4-5, 2009 and it didn't disappoint! This event included an unusual breakout session titled "Innovating During the Downturn: How to Survive Our Own Worst Case Scenarios." Instead of a lecture, we were led through a creative breakthrough thinking session that made innovation palpable. Carsten Wierwille, General Manager, frog design, New York, and his associate, Luke Williams, led us through the exercise. frog design focuses on innovation. As Carsten explained, innovation and creativity suffer significantly during tough times. There are ways, though, to not lose creativity. We would experience such an approach using The New York Times. Routinely, we use use patterns of perception to organize our lives into patterns that we can easily recognize. Without these patterns, we would have difficulty processing information and making our way through life. Situations occur, though, when our patterns of perception become a problem. They prevent us from coming up with innovative solutions. How then do we break through? How do we come up with alternate solutions? frog refers to the solution as lateral thinking, a term that Edward de Bono developed. Lateral thinking uses an indirect and creative approach to solve problems that a linear or logical approach fails at. + Captain Sullenberger, the USAir Pilot, considered an innovative solution when he landed his plane on the Hudson river. Some might have considered the solution absurd. It worked. + In the Mann Gulch fire of 1949, a firefighter invented a technique called "escape fire." Lateral thinking: breaks out of existing thinking; it changes patterns of perception. Humor and creativity work in brain the same way: a punchline moves us out of a linear mode. In the telling of a joke, we are taken along the main track. Suddenly, we are shifted to the end of the sidetrack and immediately see the track we came from. "Lateral" refers to moving sideways across patterns instead of moving along them as in normal thinking. Every valuable creative idea must always be logical in hindsight. We were deliberately shown a map of the world upside down. This is provocation! Provocation creates mental instability that forces the thinker to develop new ideas. The provocative statement needs to lie outside our normal experience - otherwise it will not have any provocation value. Effective provocation statements force you to go outside of your realm of experience. They are deliberate ways to force creative insight and step up to C [see photo above] and into lateral thinking. We set off on our own provocation exercise about The New York Times facing disappearing ad revenue. The room was broken into four groups. Each addressed a different facet of the problem. On sheets similar to the one pictured above, we chose a provocation and went about generating creative thoughts. We imagined no customers, leasing out writers, and buying shares of a writer. What we discovered is that solutions aren't always obvious. But, with a change in framework, or a provocation, we are better able to discover and consider innovative solutions that add considerable value. Have you come across interesting instances of provocation that generated innovation for you? Would you tell me about it?